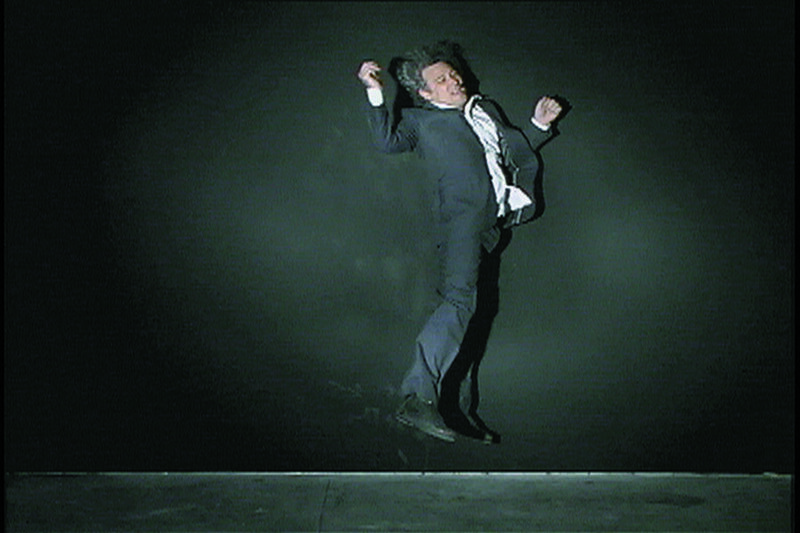 In Wall Piece, the image of a man repeatedly flinging himself at a wall and speaking a single word with each impact is projected on the wall of a completely darkened space. During recording, a single flash of extreme high intensity strobe light (the only light source) “captured” the body at the moment of contact. These singular moments were then edited together to form a linear text and a sequence of a body in various positions up against a wall. In the installation, the same kind of strobe light used for the recording is mounted on the floor and focused on the projection. It flashes at approximately 60 cycles per minute, going in and of synchronization with the recorded flashes of light. At times, the light presages the image, echoes the image, or when in unison, obliterates the image. An example of this work was first exhibited in a solo exhibition entitled “Gary Hill: The Performative Image,” at WATARI-UM, The Watari Museum of Contemporary Art, Tokyo, Japan, September 1, 2000 – January 14, 2001; Towers Plaza Hall, Nagoya, Japan, February 3 – 17, 2001. “The 46th Biennial Exhibition: Media/Metaphor,” The Corcoran Gallery of Art, Washington, DC, December 6, 2000 – March 5, 2001. Group exhibition. Donald Young Gallery, Chicago, Illinois, January 19 – March 3, 2001. Solo exhibition. The Winnipeg Art Gallery, Winnipeg, Manitoba, Canada, January 25 – April 29, 2001. 49. International Art Exhibition, La Biennale di Venezia, Venice, Italy, June 9 – November 14, 2001. 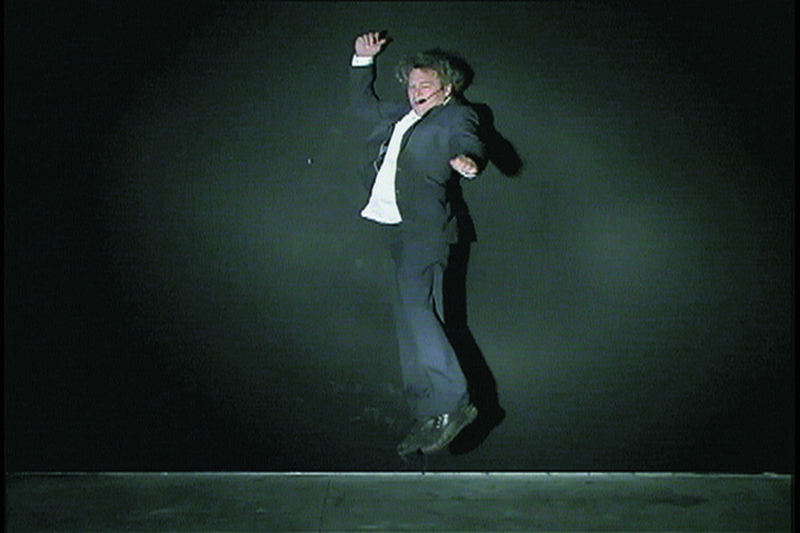 “Gary Hill,” 13th Videobrasil Electronic Art International Festival, São Paulo, Brazil, September 19 – October 21, 2001. “New Frontiers,” Art Association, Jackson Hole, Wyoming, January 11 – March 1, 2002. Solo exhibition. Handwerker Gallery, Ithaca College, Ithaca, New York, March 4 – April 7, 2002. “Visitors,” Konsthallen Bohusläns, Uddevalla, Sweden, March 16 – May 29, 2002. 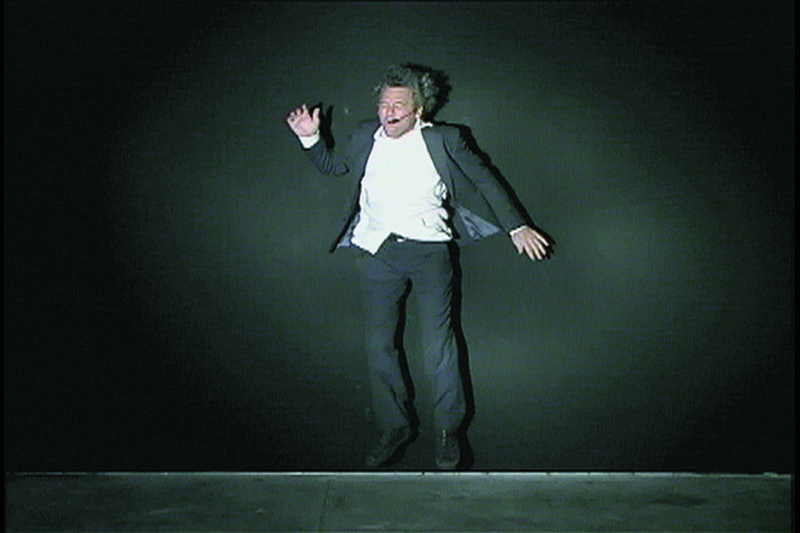 “Acquisitions 2001 – Part 1: Photographs, Video-Installations, Video,” EMST National Museum of Contemporary Art, Athens, Greece, March 21 – May 18, 2002. “Self-Portraits from the collection of Bill and Ruth True,” The Wright Exhibition Space, Seattle, Washington, May 1 – August 31, 2002. “Ommegang-Circumflexion,” Brugge 2002, Roeselare, Belgium, August 9 – September 22, 2002. “Gary Hill: Wall Piece,” Katherine E. Nash Gallery, University of Minnesota, Minneapolis, Minnesota, February 24 – April 8, 2004. “River Styx,” Western Bridge, Seattle, Washington, May 28 – September 24, 2005. “Praying for Silence,” Kunstverein Ludwigsburg, Germany, July 8 – September 4, 2005. “re:currents,” Fosdick Nelson Gallery, School of Art and Design, Alfred University, Alfred, New York, October 21 – December 2, 2005. “18: Beckett,” Blackwood Gallery, University of Toronto at Mississauga, Ontario, Canada (traveling exhibition); November 8 – December 21, 2006; Walter Phillips Gallery at The Banff Centre for the Arts, Banff, Alberta, Canada, March 31 – May 27, 2007. “Space: Places of Art,” Akademie der Künste, Berlin, Germany, February 18 – April 22, 2007. “Gary Hill: o lugar sem o tempo / taking time from place,” Oi Futuro, Rio de Janeiro, Brazil; July 20 – September 6, 2009. “Vortexhibition Polyphonica,” Henry Art Gallery, University of Washington, Seattle, Washington, October 3, 2009 – Summer 2010. Festival Temps d’Images, Museu do Chiado – Museu Nacional do Arte Contemporâne, Lisbon, Portugal, October 15 – November 21, 2010. “The Frustration of Expression,” The Center for Photography at Woodstock, New York, November 13 - December 23, 2010. “Everything Changes,” DNA Galerie, Berlin, Germany, January 30 - March 31, 2011. “Undeniably Me,” Galerie Rudolfinum, Prague, Czech Republic, May 25 – August 14, 2011. “Wall Piece,” Kunstverein Ruhr, Essen, Germany, June 18 – July 31, 2011. “Projecting Identity,” Drake University, Des Moines, ID, November 9, 2012 – December 14, 2012. “Gary Hill – Solo Exhibition,” The Center for Contemporary Art, Tel Aviv. Isreal, November 22, 2012 – January 21, 2013. Beijing Media Art Biennale, CAFA Art Museum, Beijing, China, September 25, 2016 — October 9, 2016. "Monster Club," Asia Culture Center, Gwangju, South Korea, November 24, 2016 — February 26, 2017. Rowlands, Penelope. “Gary Hill’s Hall of Mirrors.” ARTnews 100, 5 (May 2001), pp. 176 – 177, 179. 49. Esposizione Internazionale d’Arte, La Biennale di Venezia. Vol. I. Venezia: La Biennale di Venezia, 2001, pp. xxiv, 90 – 91. McAlear, Donna, ed. Gary Hill. Winnipeg: The Winnepeg Art Gallery, 2001, pp. 12 – 13, 17 – 26, 29 – 43, 59 – 63. Von Zeipel, Agneta. Visitors. Uddevalla: Konsthallen Bohusläns, 2002, unpaginated. Gary Hill: Selected Works and catalogue raisonné. Wolfsburg: Kunstmuseum Wolfsburg, 2002, pp. 29, 30, 206, 240 – 241. Ommegang Circumflexion. Brussels: Phidias, 2002, unpaginated. Quasha, George. Gary Hill: Language Willing. Barrytown, NY: further/art and Boise: Boise Art Museum, 2002, pp. 7, 10 – 21, 24, 30, 44. Kroksnes, Andrea. Body Matters. Oslo: The National Museum of Contemporary Art, 2003, pp. 22 – 23. Unfolding Vision: Gary Hill, Selected Works 1976 – 2003. Taipei: Museum of Contemporary Art, 2003, pp. 18, 54 – 56. Praying for Silence. Ludwigsburg: Kunstverein Ludwigsburg, 2005, unpaginated. Brochure. Gary Hill: Resounding Arches / Archi Risonanti. (Catalogue and DVD.) Rome: Ministero per i Beni e le Attività Culturali Soprintendenza archeologica di Roma, and Milan: Mondadori Electa S.p.A., 2005, pp. 29 - 31. 18: Beckett. Mississauga: Blackwood Gallery University of Toronto at Mississauga, 2006, pp. 18 – 19, 27, 65 – 66, 75. RAUM. Orte der Kunst. Berlin: Akademie der Künste, pp. 294 – 295, 375. Quasha, George and Charles Stein. An Art of Limina: Gary Hill’s Works and Writings. Barcelona: Ediciones Polígrafa, 2009, pp. 27, 37, 56, 353 – 355, 361, 362, 364, 371, 453, 599, 605. Gary Hill: o lugar sem o tempo / taking time from place. Rio de Janeiro: Contra Capa Livraria / Mag Mais, 2009, pp. 14, 15, 30 – 45, 67 – 75. Gary Hill: Viewer. Moscow: GMG Gallery, 2010 (in Russian and English), pp. 16, 17, 18, 19, 30, 31, 32, 33, 44 – 47. Falemos de casas: Quando a arte fala arquitectura / Let’s Talk About Houses: When Art Speaks Architecture. Lisbon: Athena / Museu do Chiado, 2010 (in Portuguese and English), pp. 68 – 73. Note: This text is excerpted from a text written by the artist in 1996 and first used in Reflex Chamber, 1996. A word is worth .001 pictures. To be transfixed is no longer an option. I am in a way blind. I live time through a succession of pictures I’ve known since when. But it’s precisely this when that haunts – it eats out the looking cavities and smiles inward like a Cheshire cat. What I might name as “the immediate surroundings” has all but vanished. I have no place. No feet. I’ve lost the vague idea of limbs. Legs feel more like logs arranged for a fire. I remember a dream of holding the other’s heart in my hand; for a moment I live the pulse of another being. Then it was over and I gave it away to a hungry animal. Lush sensations have ceased. I have no mouth, no scream, no voice within. I only listen to an imaginary sound I might make. I am supersonic and alien. I have the feeling of being a fuselage. Am I walking? Sitting in a chair? Killing? Eating? Could it not be any of these things – any and all simultaneously? Where am I? I can’t remember at will. It can only be described as something holy for fear of something completely other. Parts come back not quite like what was before but the connection is certain. A few switches flipped – that’s it. The wherewithal generator is next to close by – it’s happening right before my hands. I’m synthesized. Thought that won’t let go brings to mind the terrifying possibility – it’s only words that separate things. I feel abandoned by the real, leaving what’s left. I’m going, watching myself go. Everything’s changing speed – backing into itself. The effect mesmerizes. Movement eludes me. I’m paralyzed. Waiting awaits what’s left. It’s doing exactly what it says. No question. No questions. Circumstance is at a standstill. Things have exited. If I go everything else will follow, I know it. It knows it. There is nothing to leave. Nothing. Difference exists only through sound; a wall of sound. Can I go through it? Can I go through with it? Where is it now, where does it reside? What does it feed on? Why does it flicker? Nothing approximates its speed. It’s something from the outside. Way outside. I didn’t think this. This is not me. I’m not accountable. It wasn’t thought out. It has no relation to thought. This is that hole that everything must pass through. I’m going now before it comes. Will I know when it comes? Will it approach with signals? Will there be a moment of recognition? Is that when I am it? Am I simply tapping myself on the shoulder? What is the point? It’s always there; on again; on again. It waits without pathos. Waiting is human. This point wants to show me something inhuman. It wants to bring me to my knees. It wants me to pray, it wants me to see through seeing, it wants me to act like knowledge. It wants acknowledgment. It wants me completely at the edge. It burrows itself in, blows up and begins again plural------Points. Cells.